Posted on 29. Oct, 2010 by Corey in All, Dayton Dragons Baseball, General Baseball. 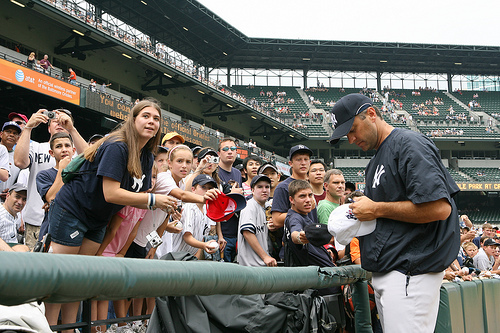 To every sports fan, adding an autograph to your collection can be a big deal. It is gotten to be such a big deal, that sports memorabilia has become a billion dollar industry. To think that some athletes get paid money to sign their name on an item is crazy. I do have great memories as a kid getting to Riverfront Stadium early and leaning over the rail down the baselines trying to get anyone to sign my ticket stub or baseball that I brought with me. Half the time I had no idea who the athlete was that was putting their “John Hancock” on my item, but I was still thrilled to run back to my parents to show them what I got. From a young age, my dad always had a rule that he told me, “Son we don’t pay for autographs.” So I grew up knowing that if I didn’t obtain one in person, I was going to score the signature. The only time I can remember that my family paid for an autograph was a signed baseball by Ken Griffey Jr. and his dad Ken Griffey Sr. The money went to a charity, so we justified that is was a good cause. Little did I know many years later obtaining a Griffey Sr. autograph would be pretty easy, as the two of us worked together with the Dayton Dragons. Just as I have seen girls practicing writing their names with famous celebrities last names attached to them, I have seen many professional athlete hopefuls practicing their signature on paper. Over the years I have seen some pretty unique ones, and seen others that are impossible to read. One of the coolest signatures I have seen took place following this baseball season with the Dayton Dragons. 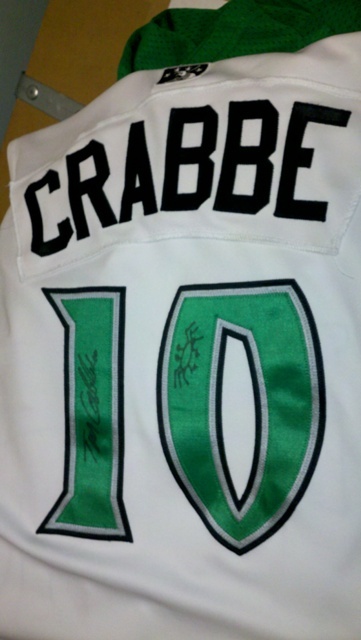 At the conclusion of the season, the team has each player sign his game jersey’s to be raffled off at each home game the following season. It gives the team a chance to collect fans information for future mailings and ticket sales, and gives the fans a chance to own a signed game used Dragons jersey. Pitcher Tim Crabbe had a “logo” that he placed next to his signature on his jersey. 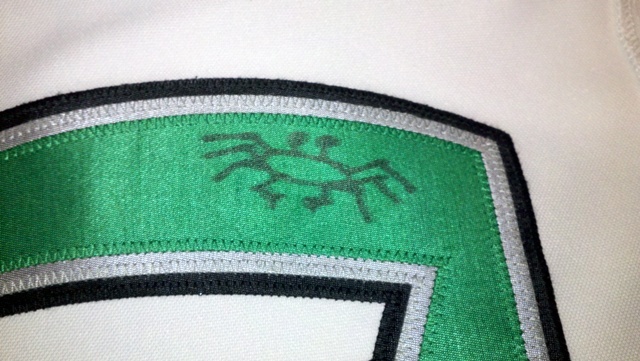 Playing off of his last name, he drew a mini crab to go along with his name in Sharpie on the jersey. As I get older and continue to build my personal collection of memorabilia, I am happy to say that almost all of my autographs were obtained in person directly from the athlete and no money exchanged hand. Some day when I have the time and space to display them all, I would love to bring pictures to you all. If you have any cool or out of the ordinary signatures that you would like to share, please send me a picture or drop me a note at Corey@coreybrinn.com.